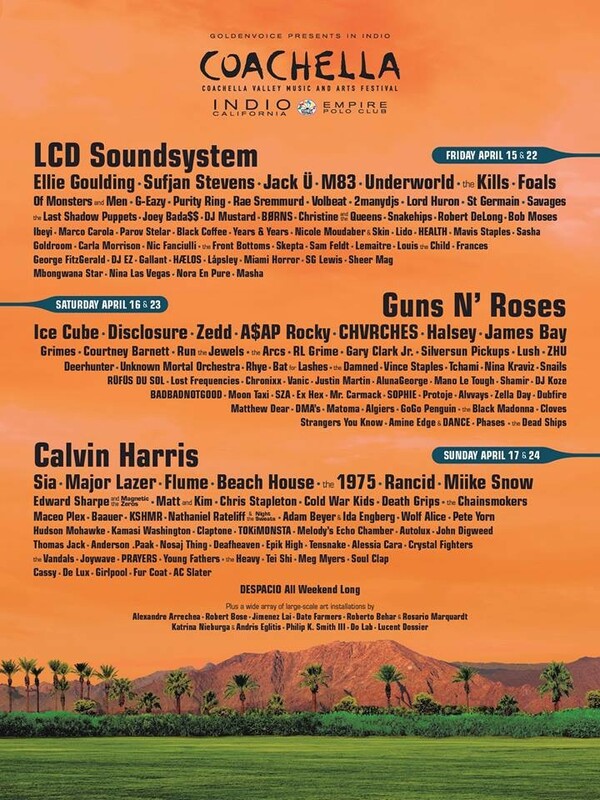 The Coachella music festival announced its lineup Monday for its two April weekends in Palm Springs, basically the launch of the American music festival season, and the big news was two reunions among the headliners: Guns 'n' Roses and LCD Soundsystem. Click on that poster to see the whole lineup. The Guns 'n' Roses gig is getting most of the attention, since the original lineup hasn't played together since 1993 thanks to the unabashed hatred between mercurial singer Axl Rose and lead guitarist Slash. But it's amazing what a fat paycheck can do to melt icy relations, and rumors are rampant that Coachella will be the launch of a summer-long stadium tour for the old metalheads. Coachella won't feature the original lineup, as neither rhythm guitarist Izzy Stradlin or original drummer Steven Adler are involved as of yet, but no doubt there will be plenty of old rockers willing to shell out ticket money to see Axl and Slash do "Welcome to the Jungle" while they ogle young girls at the festival to see Ellie Goulding or Taylor Swift's boo Calvin Harris, headlining the final night. Maximum potential for creepiness in booking GnR for sure. More exciting, at least musically speaking, is the return of LCD Soundsystem after a five-year hiatus. James Murphy is rumored to be working on new music, and a big tour could follow Coachella. The band went out on a high with shows at Madison Square Garden captured in the excellent documentary Shut Up And Play The Hits. I imagine that's what they'll do at Coachella. Scanning the Coachella lineup, one can only imagine how many of the acts going to SoCal will arrive at The Gorge just a month or so later for Sasquatch. Many of the artists already have played the Memorial Day weekend in Washington, but it would be pretty sweet to get some of that GnR/LCD action up north, along with the Lush reunion tour, The Arcs (new project by The Black Keys' Dan Auerbach), breakthrough roots-country dude Chris Stapleton, prog-metalers Deafheaven and Arctic Monkeys' side project The Last Shadow Puppets. So, what are the odds of Sasquatch getting Guns 'n' Roses and LCD Soundsystem this spring? I'd wager considerably higher for James Murphy's dance-rock gang. If Axl and Slash can keep it together beyond Coachella, expect the Gunners to focus on making all the money they can, rather than playing many festivals. LCD Soundsystem, on the other hand, could mix in headlining shows and festival dates for the rest of the year and reach their natural fan base while also making more money than they ever did before splitting. But you never know. We'll find out when Sasquatch announces their lineup next week.